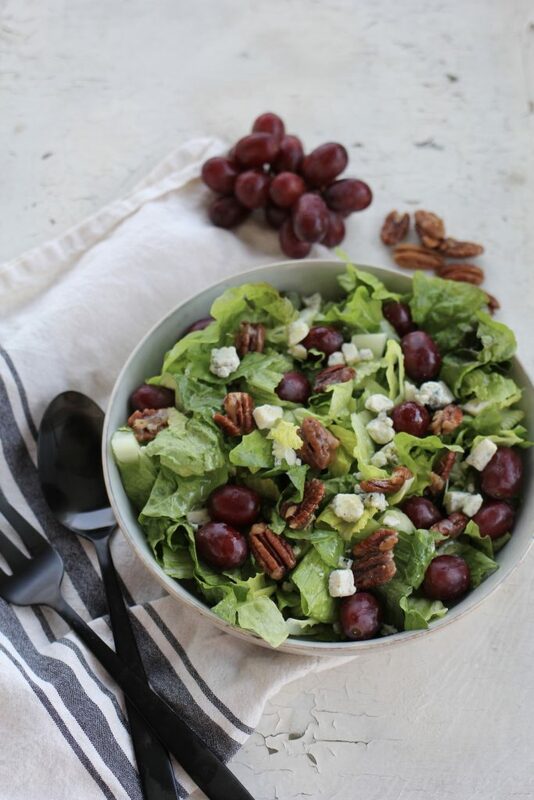 Gorgonzola Pecan Crunch Salad with Hazelnut Vinaigrette is the perfect salad for any occasion. Add some chopped chicken and you have a complete meal. 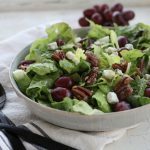 My favorite feature of this salad is the caramelized pecans, which are a tiny bit spicy from the light sprinkle of cayenne! It’s crunch time. Thanksgiving is just a couple weeks away! You have everything figured out- turkey, rolls, mashed potatoes, pies, etc. Do you have a salad to serve? Maybe something fresh to with with leftovers the day after Thanksgiving? 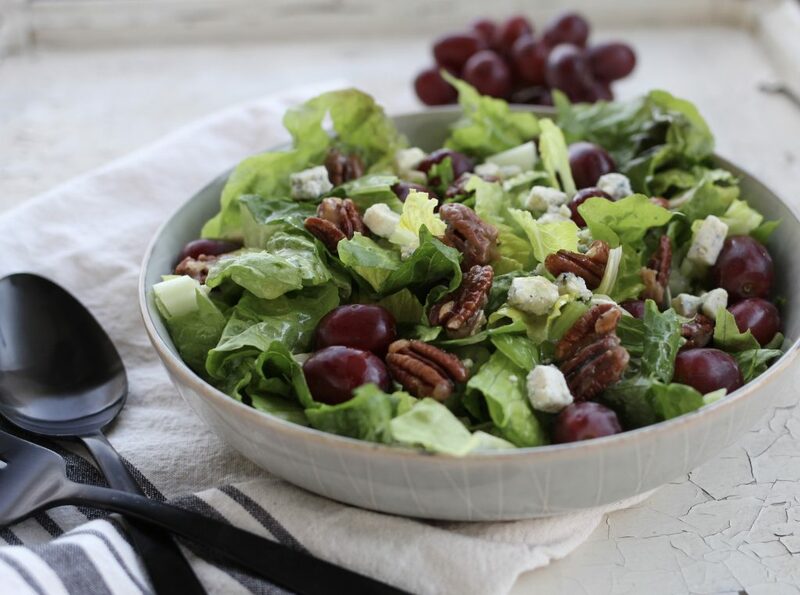 Whenever you want to serve it, this gorgonzola pecan crunch salad is your answer. It’s light, fresh, the perfect green salad for turkey day. I love this salad for so many reasons. One of them is how EASY it is to make. It’s simple to make but rich with delicious flavors. You can even make most of this salad ahead of time and assemble it all before you want to serve it. 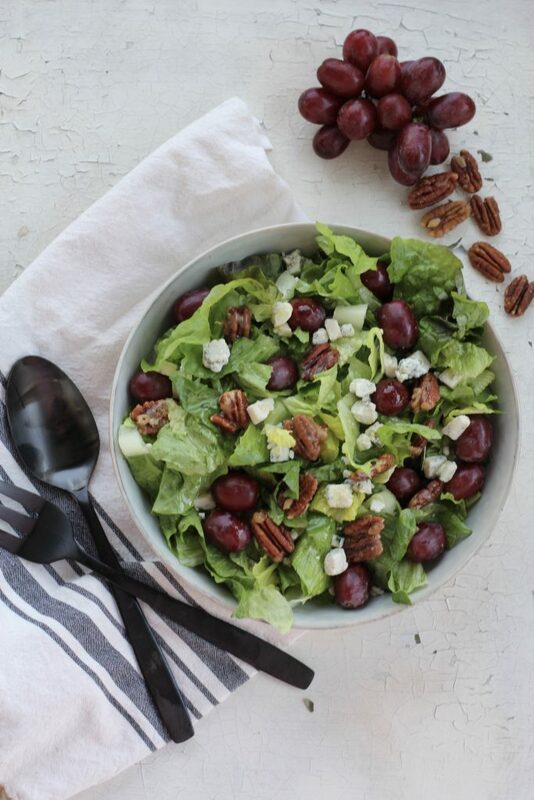 Just keep everything in separate containers in the fridge (except pecans) and toss with dressing before eating. I’m all about the make-ahead recipes for Thanksgiving. So much to do and so little time! Gorgonzola : Gorgonzola is a traditional, creamery blue cheese. The greenish-blue penicillin mould imparts a sharp, spicy flavor and provides an excellent contrast to the rich, creamy cheese. Gorgonzola is made in the northern Italian villages, according to which the cheese has its name, either from unpasteurized or pasteurized milk to which the mould is added. At about four weeks the cheeses are pierced with thick needles to encourage the spread of the mould. Gorgonzola ripens in three to six months. The taste ranges from mild to sharp, depending on age. Wash and dry the lettuce. Combine with chopped bacon and grapes in large bowl. Chill. Combine pecans with butter, sugar, salt, pepper and cayenne in non stick pan. Cook over medium heat until the sugar caramelizes. Stir often. Pour onto a lightly greased sheet of foil. Let cool completely. Break up pieces by hand or chop on cutting board. Combine all of the dressing ingredients in bowl, or jar and whisk until well blended. Refrigerate leftover dressing. Usually, about half of this dressing is enough for one salad. If you are unable to find hazelnut oil, or can't afford it (it's about $6 for an 8 oz bottle) you may substitute 1/2 cup canola oil and omit the hazelnut and olive oils. When I make this in large quantities-50 servings or more, I always substitute and use Canola oil. I've found the best way to make this dressing is to purchase frozen concentrate oj. Thaw about 2 tablespoons in 1/4 cup of water. Stir and use in dressing. The concentrate mixed with a little water gives the dressing great flavor! Tried this for our Christmas dinner this year and loved it!